One of the fastest growing software companies in Los Angeles needed to expand and establish a new company image to reflect the successful company’s culture. This high technology company started out renting a small suite and began expanding into the surrounding suites in the building. J S D A transformed a disjoint set of offices and meandering hallway into a well planned fluid corporate headquarters. The essence of this company’s culture is represented through dynamic shapes, bright colors and interesting textures in the Reception Area upon entering the space. Most remarks include “Wow!” Artwork displays clipart from their software products. The Oval Conference Room is prominently located in the front of the space where a large group of people can meet. 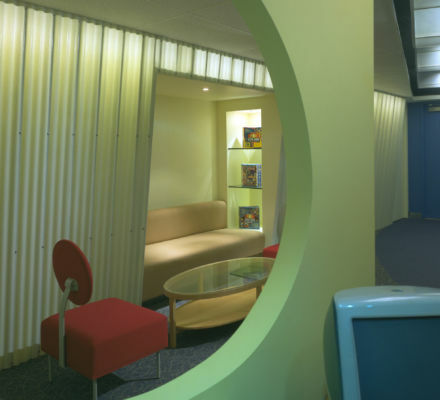 A small informal gathering space was designed for the remaining space behind the Oval Conference Room. 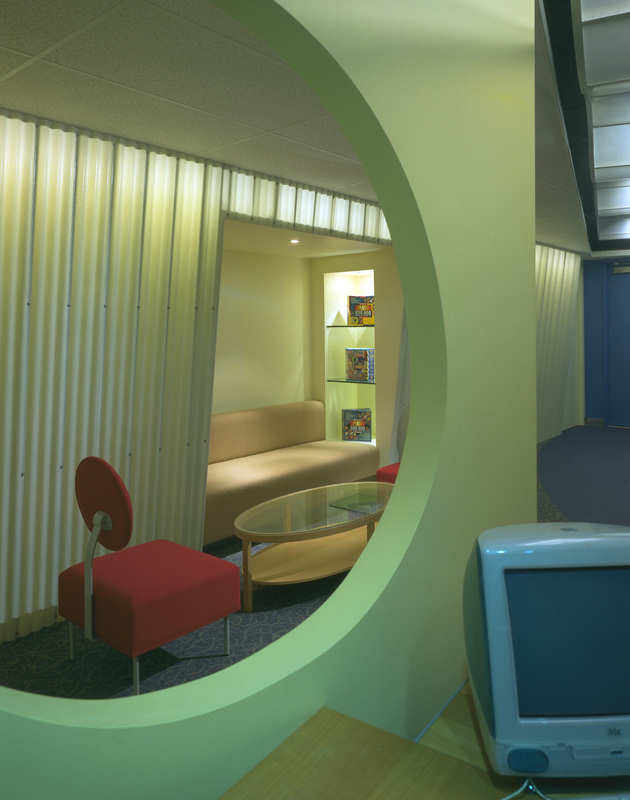 In order to bring in natural light to the workstations, frameless oval windows, similar to the conference room plan, were carved out of the drywall with a frosted glass covering the opening at the private office wall. 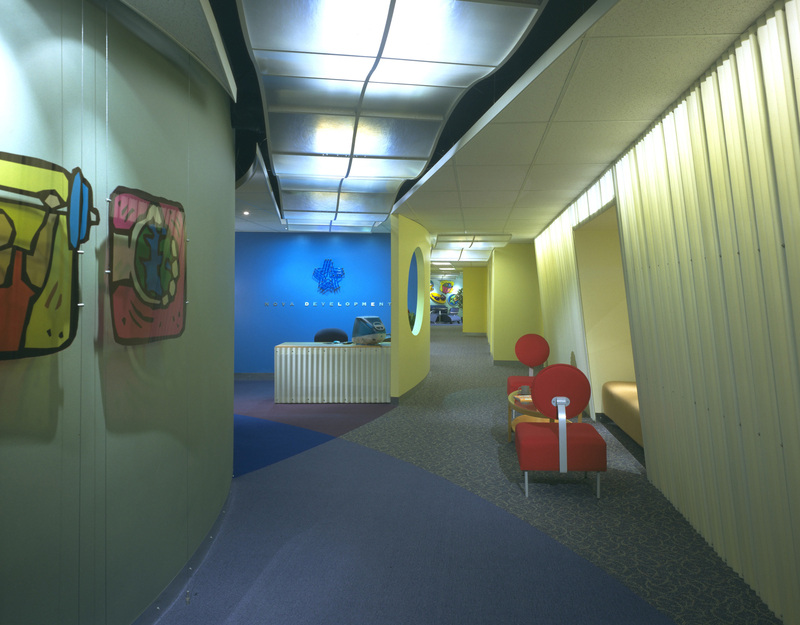 This enhanced the unification of the space by creating rhythm like musical notes in a linear hallway. Employee retention is a critical issue for companies constantly in need of highly skilled workers. The client needed a creative space where workers can work hard, relax, and have fun. The Oasis area, in the center of the space was designed like an outdoor park. It is an area where people can lounge, play games during their breaks, and enjoy company-sponsored refreshments. Relaxing colors like blues and greens were used, accenting the space with bright colored clip-art elements connecting from the Reception area. Inexpensive materials were used to infuse a lofty industrial look, with a refined feel. Corrugated translucent plastic walls were tilted slightly to change perspective and are backlit using industrial strip lights. These illuminated walls give the space a sense of excitement and motion. 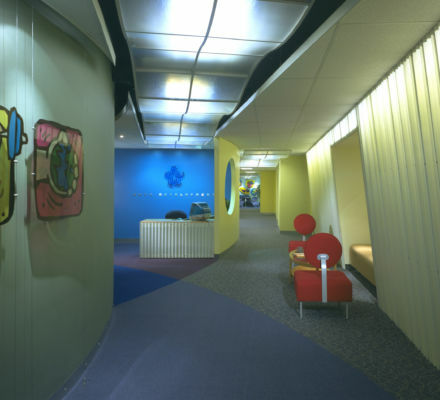 The translucent wavy ceiling system, or the “potato chip,” is strategically used to direct visitors to the Receptionist, to unify the look of the space where hiding the existing ceiling grid inequities due to the progressive “growth rings.” These simple design solutions were inexpensive, saved downtime and produced a creative, dynamic, and functional workspace.